Finesse spikes used when bait fishing for squid. Available in 14cm or 16cm. 2 per pack. King of the squid jigs, this series is designed to excel in tough conditions. The Live series features the industry leading 'warm jacket' technology and is available in 4 sizes and over 50 colours! New 2018 AU exclusive colours! 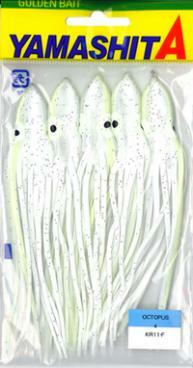 Egi Oh Q LIVE squid jig featuring a patented thermo-storage cloth called the 'warm jacket'. Tuned 600Hz rattle inside the body, warm jacket cloth, slim nose design and 490 glow! Available in 6 sizes the Egi Sutte R squid jigs feature skeleton glow bodies stainless steel hooks and a slim head design. Available in sizes 6", 8", 10", 12" in a wide range of proven colours. Made with Japanese materials, soft and supple with an excellent action in the water. 1.5 (45mm) to 4.5 (135mm) skirts made using top grade Japanese materials, proven colours and the incredible suppleness Yamashita is famous for. The Yamashita jig chaser is designed to resemble baitfish. Kingfish Sabiki is available in two sizes, 40lb and 60lb. 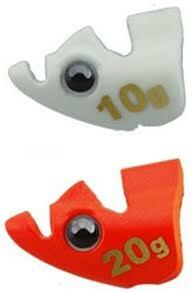 The new Naory RH jigs feature the 'warm jacket' cloth, glow and 490 glow bodies and 2 sink rate options. Available in sizes 1.5, 1.8 & 2.2. A rigged Naory RH with an Oppai Sutte branch jig, simply clip it onto your mainline and your ready to go. Perfect for targeting Arrow Squid. Available in 75mm and 95mm, these skirts are designed to be attached to assist hooks, increasing the action and presentation of your metal jigs. Strong glow body with the ability to add bait and a glow stick for improved results.